What is "prophetic revelation" from God? And what is the believer's role in receiving and activating it? James Goll, author of the best seller The Seer, explains that although some believers are especially gifted as prophets, every follower of Jesus receives the gifts of revelation and dicernment. And every believer needs to use them! In fact, without discernment and sensitivity to the Holy Spirit, we cannot progress in our use of any of the gifts and callings. With clear explanations, scriptural illustrations, and real-life contemporary stories, Goll demonstrates how we can receive revelation through the natural senses of sight, hearing, touch, smell, and taste—and how to open ourselves up to the comparable supernatural senses through which God wants to speak. He also removes uncertainty about how to discern revelation and test the spirits, so that every believer can fulfill their ultimate purpose: extending Jesus' powerful kingdom on earth. 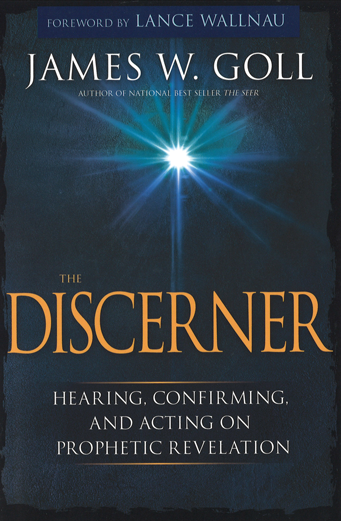 The Discerner is both a wonderful introduction to the prophetic lifestyle and a challenging call for those already immersed in prophetic revelation.